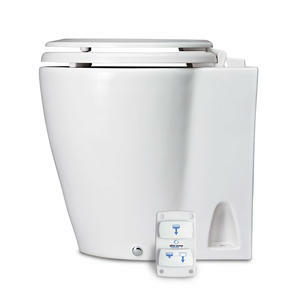 Design silent electric compact toilet with seperated flushing and waste disposal cycle. Including electronic 3 function control panel, before use, after use and short use plus a trimmer to regulate the flow rate. Water is from existing pressurized water system onboard with 12V solenoid valve (PN 07-66-030) or 12V flush pump (PN 07-66-032)- not included! Silent operation and low water consumption. Easy to clean white ceramic design bowl and white wooden seat. 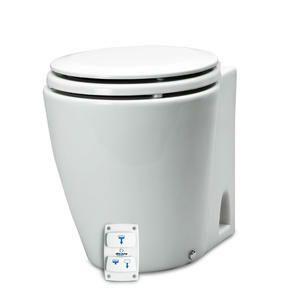 Robust, stable and compact with a preferred appearance like a home toilet.